Bright & done right. Crawl space encapsulation by Basement Systems will transform a “scary” crawl space into a clean, trouble-free area. Does your crawl space have mold, mildew, leaks, pests or just a generally unpleasant odor? Are the floors over your crawl space cold or sagging? If so, crawl space encapsulation is the answer for your problems. This special treatment is recommended to improve comfort, cut heating & cooling costs, and eliminate problems with moisture, mold and pests. A properly completed encapsulation will improve your home’s appearance, function, longevity and overall value. What does your crawl space need? Every crawl space is different. The floor can be dirt, gravel or concrete. It can be level or uneven, wet or dry. Many vented crawl spaces have been damaged by moisture, mold or wood rot. Wet, sagging or fallen fiberglass insulation is another common issue. When this happens, cold air in the crawl space can make the floors above uncomfortable. Additionally, issues such as a sagging floors or pests must be addressed. Contact your local Basement Systems dealer for a free estimate on a permanent crawl space solution. Compatible products. 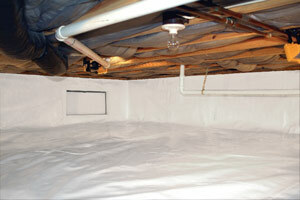 Encapsulation products from Basement Systems are designed to work together. Dimpled plastic drainage matting promotes good drainage, while SmartPipe™ perimeter drains transport water to the exterior or to a sump pump. Wall & floor insulation can also be included in the encapsulation process. Every crawl space is unique, so it’s smart to be suspicious of an encapsulation estimate that is given over the phone without the benefit of a site visit and inspection. Your local Basement Systems dealer is trained to design a customized treatment for your crawl space based on a detailed inspection. As part of the Basement Systems network they have access to patented crawl space products that are unavailable to other contractors. This is why we’re confident in our ability to provide the best performance, appearance and value in crawl space repair. 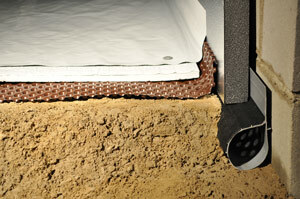 Contact your local crawl space encapsulation dealer today for a free estimate on any services for your crawl space.